Another peaceful day in modern highsec--a highsec tightly wrapped in the warm embrace of the Code. Agents of the New Order frequently refer to troubled players as "miner". E.g., "Miner, calm down." This infuriates some carebears. Rianna Storm insisted that she wasn't a miner. But she was very, very angry at the New Order. Not because she was a highsec miner who'd been ganked, you understand. No, Rianna's motives were purely altruistic. She cared about newbies. 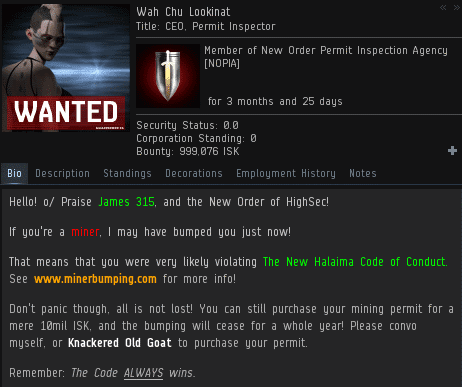 Agent Knackered Old Goat politely reminded Rianna that CCP's own study on the subject of ganking proved that the New Order doesn't drive away newbies. Rianna had a bad reaction to the truth. Rianna hated the New Order with a passion of suspicious intensity. It was as if she still felt the pain of being ganked by one of our Agents. Random passersby witnessed Rianna's hate-filled ranting in local. More hearts and minds were won to the Code thereby! Agent Wah Chu Lookinat tried to derail Rianna's tantrum by telling her how ridiculous she looked. It was clear that Rianna had no respect for our Agents or the Code they represented. She looked down on highsec PvP'ers. Rianna presented herself as a grizzled, world-weary nullsec veteran. Rianna wasn't shy about expressing her feelings. She went into great detail about why she thought highsec PvP was pathetic. The way she played the game, presumably, took a great deal more skill and courage. Our Agents continued to refer to Rianna as "miner". Once again, she protested. She wasn't a miner; she was an elite PvP'er. Her anger wasn't the result of being ganked; she just happened to read MinerBumping and got very upset about it. Things got personal. Rianna insisted that highsec PvP'ers are terrible people in real life. Which is a weird conclusion to draw, since they're so awesome in-game. I don't see what Rianna found so objectionable here. Surprise, surprise. Rianna was, in fact, a highsec miner. She'd lost her Hulk to Agent Piz Caldera. The truth is, everyone who displays such anger at the Code is a carebear who's received at least one good gank. They may try to hide it by shedding their tears from an alt, but they fool no one. Rianna didn't even bother using an alt. Apparently she didn't know that people could look up her killboard. All of her "I'm not a miner" and "I've never been ganked by you losers" nonsense evaporated in an instant. Humiliated, Rianna Storm had no choice but to log off. She wouldn't dare remain in local after that. Miners who read MinerBumping, you may laugh and shake your heads at Rianna, but take warning: When you rage against the Code and claim not to be gank victims yourselves, you don't do a better job of fooling us than Rianna did. There is your PSA today kids. Logging off. The only way AG can save you. Another glorious win for CODE. I took some time thinking of that one. :P Thanks! Agents are touted as being the leaders in civility and class.. by suggesting the gank victim would beat their wife or kids. Illegal highsec immigrants like this are a perfect example why we need strong measures of border security, including a wall on our borders with Nullsec. We're gonna build a wall and Null sec will pay for the wall. There is a huge trade deficit between nullsec and jita. These nullsec corps think they can just keep all the jobs out there away from highsec and move highsec jobs to nullsec, then flood our highsec market hubs with cheap goods. The wall will only cost a fraction of this trade deficit and will be paid for by Null sec. We're gonna bring back the jobs to highsec. Corps will move back to highsec. We will have lower taxes that will incentivize them coming back to highsec with a 15% flat tax, abolishing the IRS. Every undocumented highsec miner with no legal permit just drives down the wages and, as we have seen in the articles on this page all too often, they bring an element of criminal behaviour to an otherwise peaceful highsec. "I am not a miner." The hypocrisy of the carebear never ceases to astonish (nor entertain) me! It's an honour to once again be featured on the premiere EvE Blog on the world wide webbernet! Maybe he thought he wasn't a miner any more after his hulk got taken out. Remember, Anon. It is not CODE. 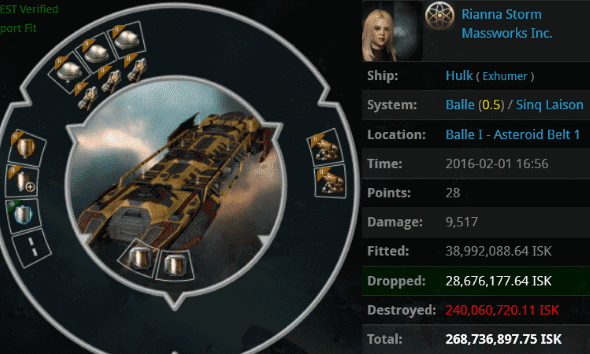 that causes players to leave EVE Online; those are players that simply cannot handle EVE Online, and we do not want those players in this game anyway. EVE Online is not a game that everybody is entitled to play the way that they want to. You suggest to the public that mining may perhaps be your profession, since all you seem to be interested in is money, and not anything more intellectually higher or morally superior.